Ram brings a new trim level, more technology, convenience and comfort to commercial work truck segment. 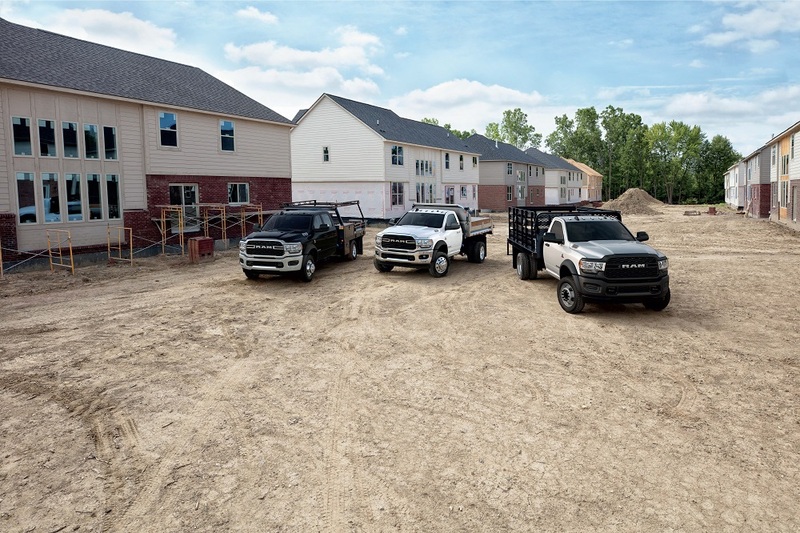 The new 2019 Ram 3500, 4500 and 5500 Chassis Cab trucks introduced at Chicago will usher in a new generation of work trucks — one that leads the segment in capability, but also never-before-offered comfort and technology says Ram. 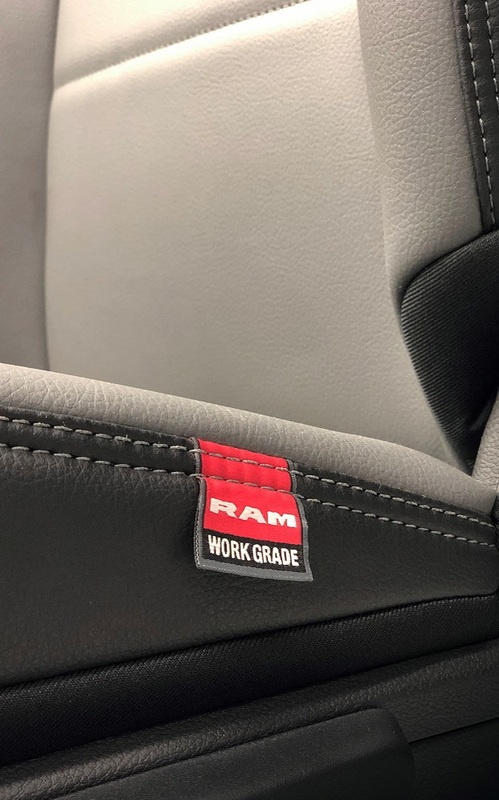 Four trim levels are offered on the 2019 Ram Chassis Cab: Tradesman, SLT, Laramie and a new Limited. They offer segment-leading towing capacity up to 35,220 pounds, a highest Gross Combined Weight Rating of 43,000 pounds and payload up to 12,510 pounds. While keeping true to the work truck mission, Ram Chassis Cab designers worked closely with engineering to give the new Ram chassis cab trucks an optional level of comfort and convenience with the new Limited aimed at enthusiast customers who have a weight need above and beyond the 2019 Ram Heavy Duty trucks. 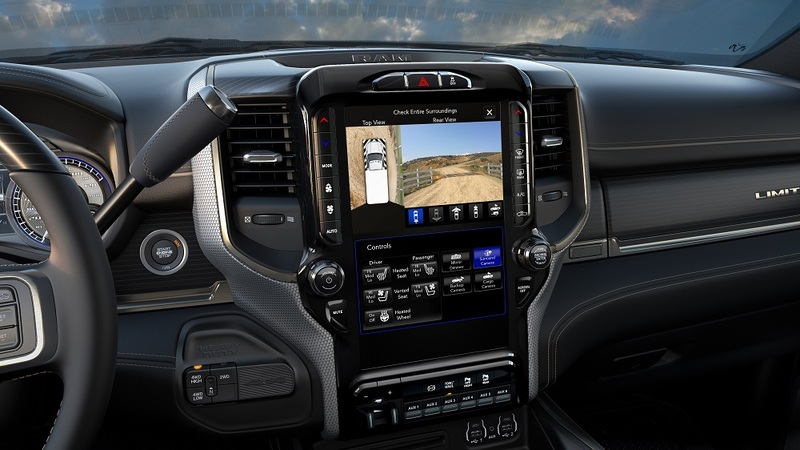 “With the Chassis Cab Limited, we’ve also created something the segment has never seen, surrounding owners in premium materials and technology with the highest quality interiors, active safety systems, and of course, our award-winning Uconnect technology” said Reid Bigland, Head of Ram Brand, FCA. The standard engine in the 2019 Ram 3500/4500/5500 Chassis Cab is the proven 6.4-liter HEMI V-8 with Fuel Saver Technology, delivering up to 410 horsepower and 429 lb.-ft. of torque using the TorqueFlite 8-speed automatic. When paired with the optional Aisin AS66RC six-speed automatic with Power Take-Off (PTO), the Fuel Saver Technology functions while in stationary PTO mode to reduce fuel consumption. In the Ram 4500 and 5500 Chassis Cab, the 6.4-liter HEMI V-8, is paired with the Aisin AS66RC 6-speed automatic transmission with optional Power Take-Off (PTO) capability. It delivers 370 horsepower and 429 lb.-ft. of torque. All Ram 3500/4500/5500 Chassis Cab applications of the 6.4-liter HEMI V-8 use interactive Deceleration Fuel Shut-Off, stopping fuel flow to the cylinders when decelerating, to improve fuel economy. A significantly revised Cummins 6.7-liter inline-six turbo diesel is optional on the 2019 Ram 3500/4500/5500 Chassis Cab. Paired with the Aisin AS69RC electronically controlled six-speed automatic transmission with optional PTO capability, the Cummins engine delivers 360 horsepower and 800 lb.-ft. or torque – the highest available torque in Class 4 and 5. Ram offers two different dual alternator systems on the 2019 Ram Chassis Cab. Models equipped with the Cummins 6.7-liter diesel engine offer dual 220-amp alternators (best-in-class 440 amps). Trucks equipped with the 6.4-liter HEMI V-8 gas engine offer a first-and-only application of its kind by combining 220- and 160-amp units for 380-amps of total best-in- class output. 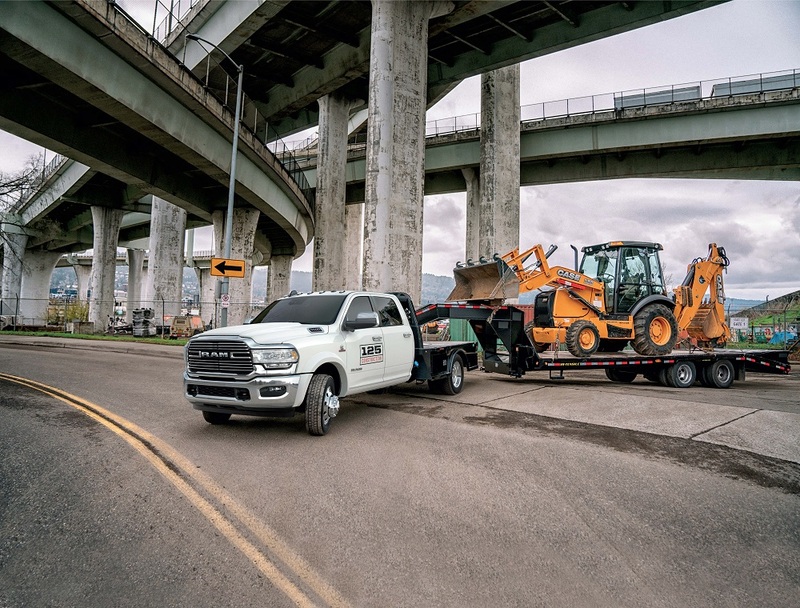 Ram Chassis Cab trucks are engineered with the upfitter in mind. They come in four industry-standard frame lengths measured in inches from the cab to the rear axle (CA): CA 60, CA 84, CA 108 and CA 120. Frame rail width follows industry guidelines at 34-inch spacing. All 2019 frames are built with up to 97-percent high-strength steel and eight separate cross members. For upfitters, Chassis Cab rear frame sections feature a C-channel design with flat mounting surface — predrilled – for zero component interference above the rails to enable cost effective upfitting. An upgraded four-wheel disc braking system delivers a confident and powerful activation with minimal braking effort yields shorter stopping distances. The 2019 Ram Chassis Cab lineup uses tuned powertrain mounts and C-pillar body hydromounts to reduce NVH and improve ride quality. Within the mounts, the viscosity of the fluid and the rubber itself have been tuned to Gross Vehicle Weight (GVW) and payload capabilities, enhancing isolation regardless of load or tow capacity. A best-in-class Vehicle System Interface Module (VSIM) is capable of communicating between aftermarket modules and factory control modules. It features more than 70 inputs and outputs for management of vehicle systems. 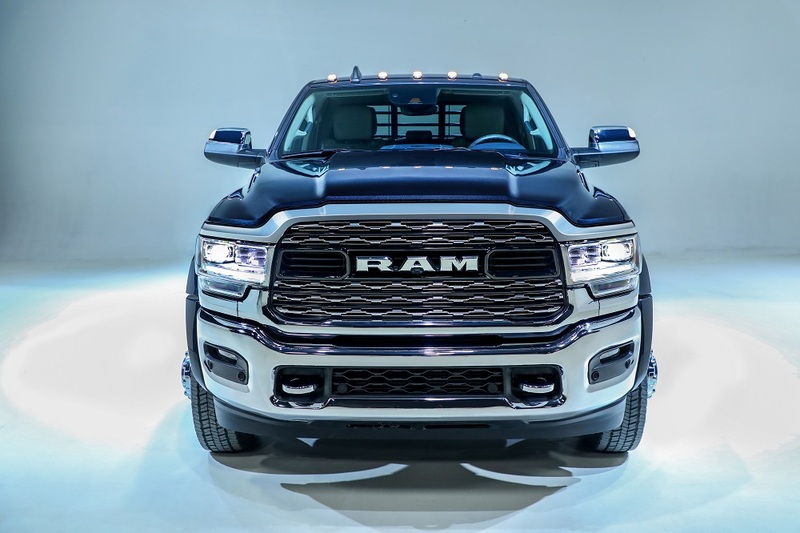 In the cab chassis segment, only the 2019 Ram Chassis Cab features Adaptive Cruise Control, Forward Collision Warning, Automatic Emergency Braking (AEB) and AEB with trailer brakes available on all trim levels. A class-exclusive ParkSense Park Assist system provides visual and audible indications and a class-exclusive 270-degree camera system with trailer reverse-guidance view gives greater field of vision. A cargo-view camera – also class exclusive – allows owners to monitor the upfit module and/or payload in the rear of the truck. The system also aids hookup with fifth-wheel and gooseneck hitches. Plus the new 2019 Chassis Cab also can monitor up to six tires on the truck plus trailer tire pressure monitoring for up to 12 trailer tires. 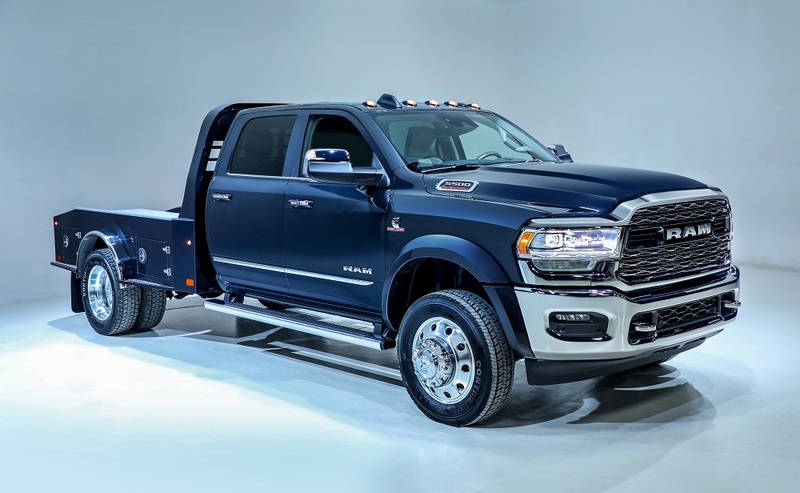 The 2019 Ram Chassis Cab line shares certain exterior design elements and features with the 2019 Ram Heavy Duty. A new instrument panel features a structurally interlocking appearance pushing the central controls up and toward the driver within the cabin for ease of use. 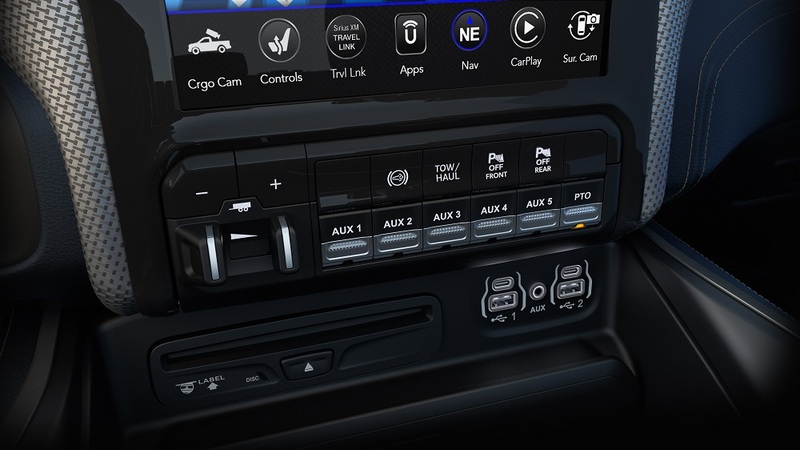 At the center, it offers the Uconnect 4C NAV on a 12-inch fully reconfigurable touchscreen with custom graphics for various Ram models. The touchscreen can display can be divided in half, operating two different applications at once. New 3.5-inch and 7-inch electronic-configurable color driver information cluster displays are easily driver customizable for the truck’s mission parameters. The Uconnect 4C also features the next level of audio entertainment with SiriusXM with 360L. It enables exclusive SiriusXM on-demand programming never before available while SiriusXM Travel Link improves drive efficiency and safety with real-time local road conditions, weather forecasts, fuel prices and live weather maps. For listening while behind the wheel, there are four available audio systems including a 750-watt Harman Kardon Audio System with 17 speakers and 8-inch subwoofer. A new ergonomic switch bank offers push buttons with up to five auxiliary switches including a PTO on/off switch. 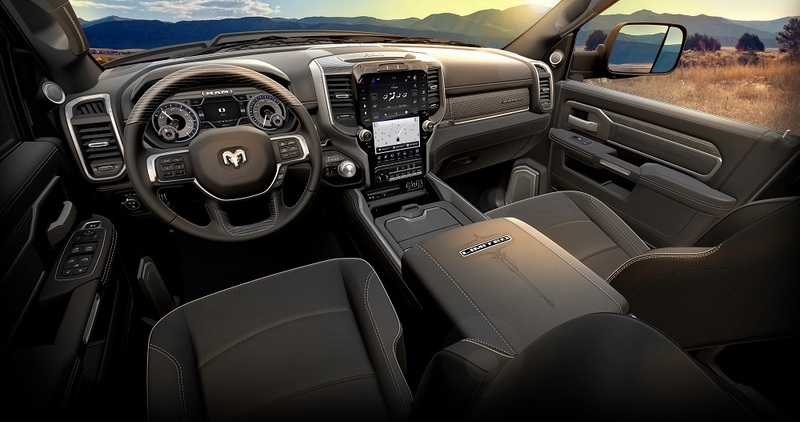 Across all trim levels, the 2019 Ram Chassis Cab features push-button start and a redesigned rotary e-shifter dial (6.4-liter HEMI V-8 with 8-speed). The new shifter area also intelligently groups transfer case controls, when equipped. Six-speed-equipped Ram Chassis Cab trucks feature a column shifter. The reimagined center console is a functional workspace with more than 12 different storage combinations. The console includes a wider docking area with optional wireless charging and can hold a small tablet or smartphone. It includes five USB charging ports, four of which are paired with type-C ports for faster communication and charging. Two 115-volt three-prong plugs can handle up to 400 watts for powering devices or tools. 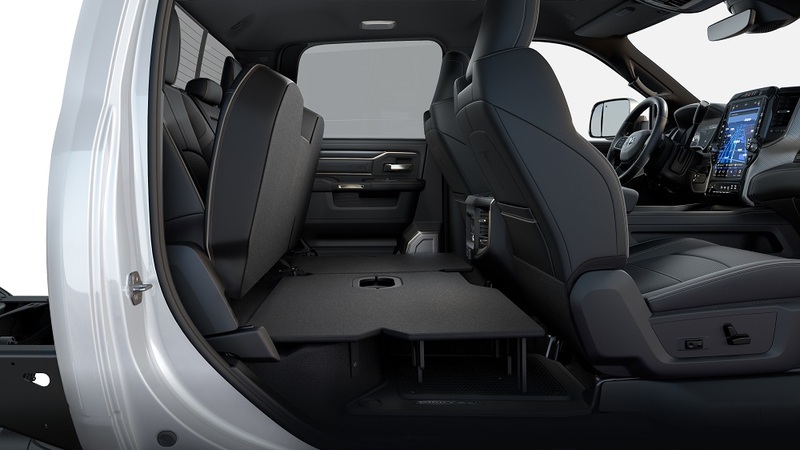 Folding up the rear bench seat reveals additional contained storage space with under-seat compartments. 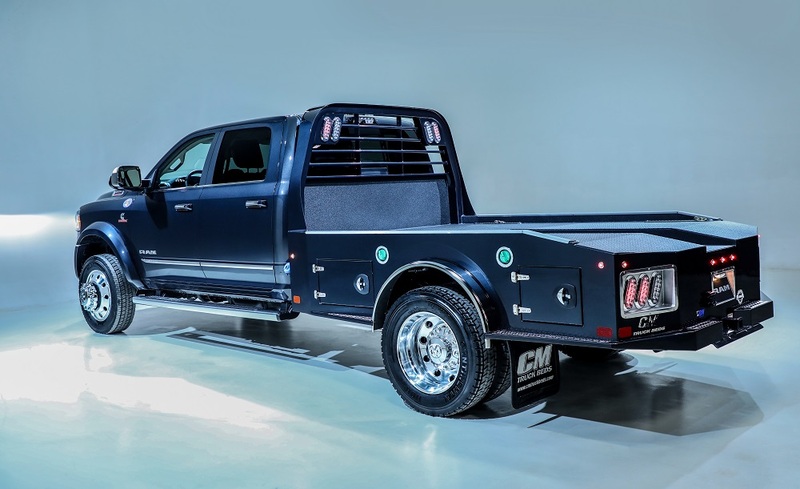 The 2019 Ram Chassis Cab also shares exterior sheet metal with Ram Heavy Duty, including a massive new R-A-M grille, which also flows a high volume of air to cool the 6.4-liter HEMI V-8 and the Cummins 6.7-liter Turbo Diesel engines. There are four different grille styles depending on the model. A new front bumper is cut with larger openings, providing greater airflow to the largest turbo intercooler Ram has ever adapted to their work trucks. Three head lamp variations are available. All three configurations deliver twice the lumen output over the last generation models. A premium level Adaptive Front Lighting System (AFS) pushes beams up to 15 degrees in the expected direction of vehicle travel. 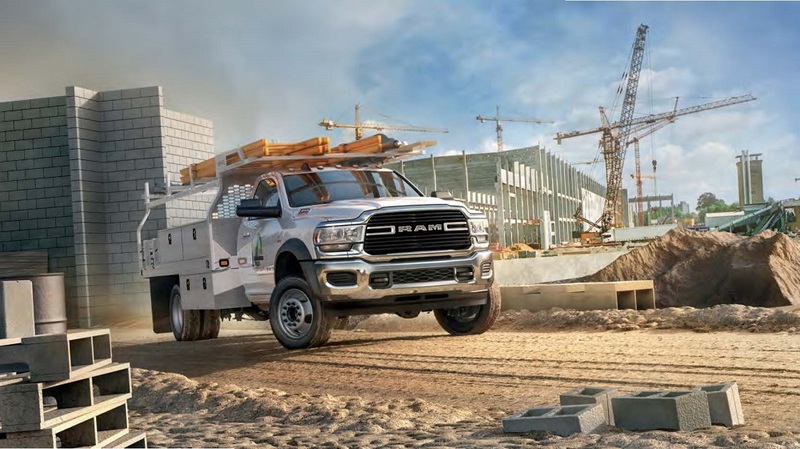 All navigation, Wi-Fi, radio and SiriusXM 360L tasks are handled by a new shark fin antenna – making the new 2019 Ram Chassis Cab the first-in-segment without a mast antenna.